My village in Scotland doesn't have many parrots, so I had to buy this skull off ebay. I bought it at the end of last year but didn't get round to writing about it until now, when I can't go on walks because of my stupid broken leg. 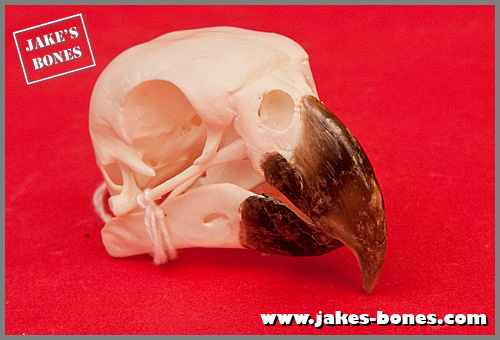 If you are at all interested in bird skulls, parrot skulls are particularly interesting. 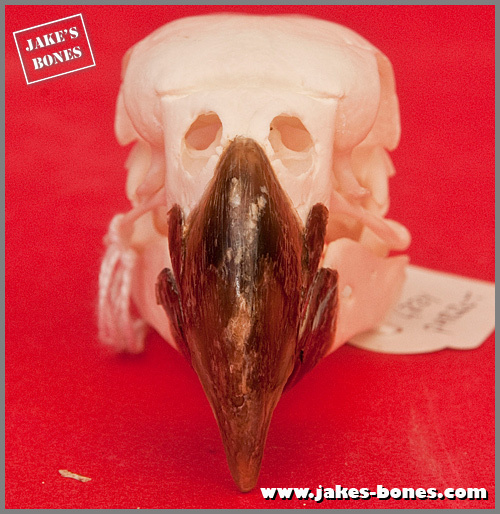 All bird skulls show how that particular type of bird gets food, like the thin long beak of an oystercatcher, or the curved short bills of raptors, or the very specialised beaks of crossbills. Parrots have evolved over time to specialise in eating hard seeds, but they look completely different to, say, finches which also eat seeds. This is a well prepared skull in an amazing condition. 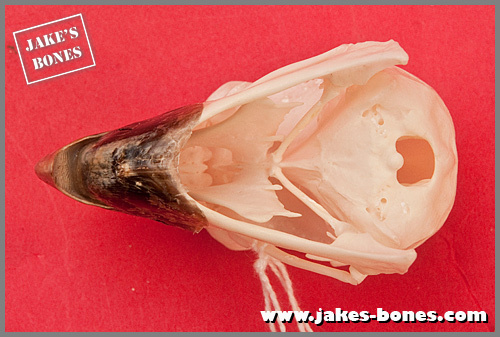 The lower jaw is glued in position, and it has beak sheets (the 'outer' part of the beak) and the quadrate bones (the bones which are the hinge between the skull and lower jaws). It is 6.6cm long and 3.9cm at the widest point. The beak is short and thick, and the lower jaws are very thick indeed for a bird, showing how strong they are. The beak curves down into a sharp point, like a bird of prey, and the lower jaw is a lot shorter. 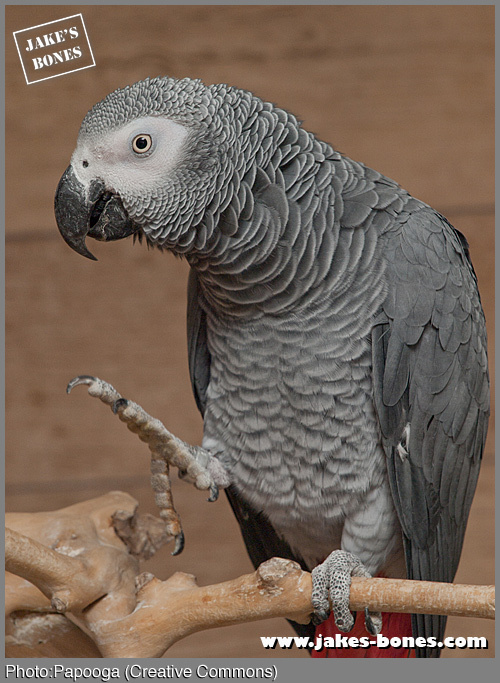 If you didn't know you might think that parrots were meat-eaters from the shape of it, and a few are, but not this one, which is an African Grey Parrot (Psittacus erithacus), which mostly eats seeds (but occasionally eats snails). The shape of the beak is not all about food, though, because it also uses the beak to grip and climb. I imagine other types of birds do this too but I can't think of any. 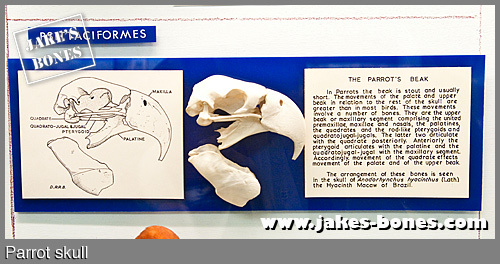 There was a display at the Bell Pettigrew Museum in St Andrews on parrot beaks because they are so unusual. Because the bottom jaw curves upwards, it overlaps with the some of the bones in the roof of the mouth. The spine enters the skull from directly underneath. I think the braincase is quite large in proportion to the skull, and parrots are one of the most intelligent birds (together with corvids). They also live an extremely long time for birds: 50 years old is not unusual, and the Guinness Book of Records says there have been ones which have lived to over 70 years old. The African Grey Parrot are popular as pets, but a lot of bird sanctuaries (like one I visited a few weeks ago) recommend not getting one because they live for so long. The African Grey Parrot is listed in CITES, which is the list of what animals (and dead animals) are allowed to be moved between countries. 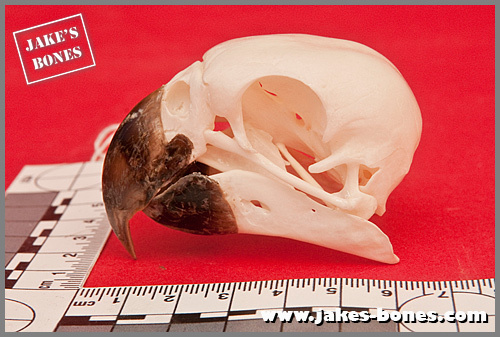 Even though the skull was sent to me from within the UK, I checked with the seller, who said that the African Grey Parrot was on the Appendix II list, so no licence was needed to have the skull. Broken leg update: my full leg cast, going from above the knee to the toes, has to stay on for at least four more weeks ! Thanks to everyone who has sent messages, especially my book editor Jo who sent a load of cool bone postcards. It's a pity the lower jaw has been glued in position. Many years ago I was always told to use water-soluble glue (such as PVA glue or Evo-Stick wood glue) for sticking in teeth or general bone repairs as you can always soak it off later if necessary. I really hope the leg is doing well and that youa re able to get about the house OK ... and maybe even get to school?! I think it's more difficult with birds because of the quadrate bone which has to be glued in. How many bones are in the African grey parrot ?